The initial idea for this episode was spurred by Lady Gaga and Bradley Cooper’s Oscars Performance but it is much more than that. For businesses focusing on data, customer feedback, market research and more can still make decisions based on what a single person or small group of people think. Does your company work like this? CEO asks 2 people or one person, everything changes hours/days/weeks before a big launch. 5 people on twitter have an issue but none of you 1,000 other customers don’t like it. The press today looks to make stories out of nothing, does your company do the same? One person in a project or company comes along at the 11th hour and makes a suggestion – everything changes. A single investor and only them suggests something, do you do it? One suggestion we have for companies is to plan ahead with capturing data around your service, product, sales, social media, customer feedback, etc. Do you send out monthly or quarterly calls for feedback from your customers? Do you have a team or part of the process where you try and extract various levels of feedback from partners or clients? Depending on your business it might make sense to look at using Net Promoter Score (NPS) to help give you data that you can track. So what can you do to get ahead of things? Alert customers of changes to a product, app, UI/UX early. Use email, talk to your customers. 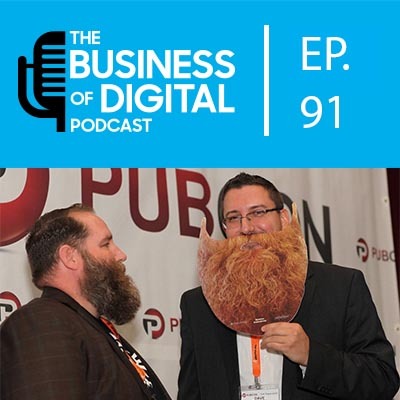 Mat Siltala and Dave Rohrer will be your hosts on The Business of Digital Podcast. With some 40 years of experience in digital between them, multiple businesses, having worked in many industries and a host of other experiences will all be used to pack in as much great content into each episode. So give a listen to one or many episodes and don't forget to subscribe!